When my husband and I first moved to the PNW, we immediately began to explore the vast wilderness areas around us so we could get to know our native plants here. One of the first things we started noticing about the trees in one particular area was that they had been drilled by woodpeckers and the resulting holes were full of gorgeous, aromatic resin. Those fragrant little pockets of sticky medicine are still one of the first things we point out to visitors who come to see us and want to know about some of our local plants. Pines are plentiful here. Pine trees have been partnered with to support health and healing for many generations. Traditionally, they are symbols of wisdom, peace and longevity. The pitch, bark, needles, hydrosol and essential oil of many varieties of Pine are used medicinally. Note: There are a few varieties of Pine whose needles are toxic, so be sure you know how to identify the species prior to wildcrafting or ingesting needles. Pine pitch is sometimes referred to as resin or sap. It is often used in survival situations to start fires and in first aid situations to help keep a wound clean and protected until it can be addressed more thoroughly (another herbal bandage, so to speak). It is often melted down into carrier oil and made into Pine pitch salve or ointment, which are common first aid preparations used to address minor cuts, scrapes, and wounds. The pitch is also a drawing substance, so it can be used to help pull splinters out of the skin. If you’ve ever collected a bit of Pine pitch, you know that it’s incredibly sticky. It’s often referred to as nature’s glue and can be used as a type of natural glue when living off the land. It’s often melted down and applied to baskets, boats and shoes to give them a waterproof coating as well. Pine resins can be mindfully harvested and used to formulate infused oils, salves, lotions and butters that can be valuable additions to your home apothecary. Native Americans used Pine resin in poultices and salves to help draw out splinters and other toxins, seal and protect [clean] wounds, and increase circulation to injured areas of the body. It is still used in first aid applications for these same purposes today. It's not uncommon to see Pine drawing salves even in conventional stores. Pine resin possesses antibacterial and possibly even anti-inflammatory properties, but is quite warming, so it can sometimes increase irritation if the area where it is applied is already red and inflamed. Use discernment when choosing which herb is best for your case, but generally speaking, Pine resin salve can be a wonderful ally for your first aid kit. To make your own Pine pitch salve, place 2 ounces of Pine pitch in a quart sized mason jar and set the jar into a saucepan of water over low heat on the stove (double boiler method). Add 4 ounces of herb infused carrier oil - I’ve used Violet leaf, Comfrey leaf and Plantain leaf infused oil as my carriers for this particular batch. It will take a little while for the pitch to melt into the carrier oil. Stir it occasionally and make sure the heat is kept very low. 1/2 ounce of beeswax melted into the mixture will help the salve to solidify once cooled. Once everything has been incorporated, strain the mixture through a coffee filter, a piece of muslin cloth, or a fine mesh sieve, pour it into a jar and let it sit until cool. Preferred species of Pine for use of the resin include White Pine (P. strobus) and Pinyon Pine (P. edulis), but all of the Pines will produce usable resin. Some of them are stronger than others. Mindful, respectful harvesting of resins is paramount. The tree produces resin to protect itself from infection when it has been injured or compromised. Be mindful of the size of the wound you're collecting from. Does the tree need the resin to stay there in order to protect itself in that area? Harvest elsewhere if needed. Don't harvest large pieces. Pine resin is super sticky. You can use olive oil to remove it from your hands if needed. I prefer to keep a separate jar and utensils just for working with resins. You may want to adopt this practice as well. Don't ever leave resins unattended while they are heating. Always use a double boiler method. Pine needles are commonly used to make baskets and were traditionally used to stuff cushions and mattresses as well. They can be used to create a sort of soft bed on the forest floor and provide a great mulch for the garden. In herbal medicine, they are mainly used to support the respiratory and immune systems. Coughs, congestion, sore throats, lung ailments, etc. are all situations for which Pine needles could be used. The needles are often used to make cough syrups and teas and are rich in vitamins A and C, among many other nutrients. To make a Pine needle serum that can be used topically, infuse dried Pine needles into a lightweight carrier oil for 4 to 6 weeks, then mix that carrier oil with a skin-rejuvenating essential oil (optional) at a 0.5 to 1% dilution. This serum can be used as a facial serum and as a body or massage oil (2% dilution). Pine cones can be used to start fires and yield seeds that we know as Pine nuts, which are a valuable wild food for humans and wildlife. Nuts can be harvested in late fall. Pine pollen can be gathered in the spring and is a nutrient dense super-food that has long been considered a sacred medicinal by native peoples. It has anti-inflammatory and antioxidant properties, is rich in flavonoids and essential fatty acids, and is a potent androgen. It can be tinctured (1:5) or sprinkled into food. Pine hydrosols are incredible skin tonics. I like to use them as facial toners and incorporate them into my herbal skin care regimen. I also use them when I'm making back lotions and creams for sore muscles. They're perfectly suited for that purpose and leave the formulas smelling forested and fresh. Pine essential oils are mainly used to support the respiratory system and the musculoskeletal system. They have analgesic, antibacterial, anti-inflammatory, antioxidant, antispasmodic, circulatory and expectorant properties and smell uplifting and refreshing, like walking through a pine forest and stopping to take a few deep breaths. Energetically, Pine essential oils are balancing and help us to feel like we are grounded deep into the earth with a clear, focused mind. Pine extracts and products have been tested in various trials in recent years and are starting to become more popular as the test results continue to show promise. Here are a few noteworthy examples of Pine's test results. Maritime Pine extract improves symptoms of allergic rhinitis. Two studies suggest improvement of erectile dysfunction when used in combination with other things. Shows potential for improving mental function and blood pressure. Lowers oxidative stress in smokers. Improves photo-aged facial skin and has been used to treat melasma and other skin complaints. Shows promise in treatment of ADHD. Improves symptoms and reduces need for NSAIDS in cases of knee osteoarthritis. Seems to have a positive effect on type 2 diabetes. Reference One, Two and Three. Potential to help reduce the severity of migraines. Improved asthma symptoms and reduced need for medication. Has shown potential for anticancer and antitumoral activity. Reference One, Two, Three, Four, Five and Six. Shows promise against multiresistant bacteria, as well as Hepatitis C (in vitro) and oxidative, inflammatory and microbial diseases. Has potential for supporting oral health. Have you ever used Pine in your apothecary? Note: Portions of this article have been excerpted from an article originally published in November's issue of AromaCulture Magazine. If you give my husband a jar of candied Ginger, it'll be gone within a couple of days. A 4-pack of his favorite Ginger soda? Three days later all evidence of its existence will have vanished. A jar of Ginger spread in the pantry? He'll pop that thing open and add Ginger to all of the meals for the next week and there will be no remaining trace of it by the next shopping trip. He really loves Ginger. It might be his favorite thing ever. I like to say he has a supercharged cold constitution because he has such an affinity for the hotter herbs. He can brew his Ginger tea twice as strong as I could ever tolerate mine and he’s been known to eat Cayenne peppers fresh off the plant, whole. So, as you can imagine, he was pretty excited when I planted up a bed of Ginger in our garden this year. Ginger is a warming herb that stimulates circulation, helps to relieve nausea, and gets stagnant energy flowing again. It contains over 450 different constituents, yields a vibrant essential oil, and is one of the most versatile pungent herbs in the apothecary. I'm going to share two different ways you can preserve it here today: candied Ginger and pickled Ginger, and then I'm going to share some other ways you can use it and a few of Ginger's noteworthy test results. Slice your peeled Ginger rhizome thinly (about 1/8") and as evenly as you can. A mandoline can be set at the proper measurement and used to keep all of your slices the same thickness, but a kitchen knife will do if you don't have a mandoline. Place the Ginger in a saucepan and cover it with water so that the water sits at least an inch or two above the top of the Ginger slices. Place the saucepan over low heat, covered, and simmer for at least 30 to 45 minutes, or until the Ginger has become tender. Strain the Ginger, reserving the liquid decoction. Weigh the Ginger, then place it back into your saucepan with an equal amount of organic sugar by weight, and add about half of the Ginger decoction back to the pan (save the rest). Place it over low heat and stir until the Ginger basically looks like a big sticky mess in the middle of the saucepan. At that point, strain the Ginger again (reserve the liquid) and spread it out on a cooling rack or cookie sheet lined with parchment paper. Separate each slice and toss it in sugar, then leave it to dry overnight before storing. The first batch of reserved liquid can be weighed and added to a saucepan with an equal amount of sugar to create Ginger syrup, which can be added to lemonades and sodas (or even drizzled over pancakes) and the second batch of reserved liquid is already a Ginger syrup and can be used the same way. Slice your peeled Ginger rhizome as thinly as possible, then sprinkle sea salt over it and leave it to set in a bowl while you prepare your pickling liquid. Combine equal parts pure water and vinegar (either rice vinegar, which is traditionally used, or raw apple cider vinegar) and a tablespoon each of organic sugar and sea salt for each cup of water you've used. Bring the liquids to a boil and dissolve the sugar and salt in the mixture. Transfer the Ginger to a heat-safe jar, then pour the freshly boiled vinegar mixture over it into the jar until the Ginger is completely covered. Let it cool, then store it in the fridge for at least 2 to 3 days before eating (it's safe to eat before then, but the flavor won't be fully developed yet). Consume within a month or two and keep refrigerated. Growing Ginger is pretty easy and the plants are vibrant and tenacious. They're always buzzing with beneficial insects and can live outdoors year round in growing zone 10, but in all other growing zones, it can be grown in a large pot and brought indoors during the cooler months. I planted mine in a raised bed this year, left it outside during our hot seasons and potted it up and brought it indoors for the winter. Ginger can be used in cooking to add a layer of depth to the flavor of your dishes. I like to use a bit of the fresh rhizome when I cook, removing it from the dish just before serving, because it adds a hint of warmth and spice that leaves people saying, "This is so good! What did you put in here?" It adds some zest and energy to the dish without making everything taste recognizably like Ginger. Perhaps most well-known for its ability to help soothe an upset tummy, Ginger stimulates the digestive system (and related organs), helps us to better digest proteins, and can be used to relieve nausea, indigestion, motion sickness, morning sickness, and a wide variety of other digestive complaints. One study found that it significantly reduced the severity of chemotherapy-related nausea symptoms for patients who were undergoing treatment. As a stimulating expectorant herb, Ginger is often included in formulas that are useful when dealing with a cold or flu, sinus issues, lung complaints, and sore throats. It also boosts the immune system, which is especially helpful when dealing with symptoms of imbalance or illness. Ginger is often included as a catalyst in cold and flu remedies such as Fire Cider and Elderberry Syrup and I personally enjoy using it in facial steams when I’m feeling a bit stuffy or as if I might be coming down with something. One study of Ginger extract, combined with the extract of Garlic, found that they had an antibacterial effect that shows potential for use against multi-drug resistant pathogens, while another found that Ginger extract was notably antibacterial against two different strains of Streptococcus bacteria. Ginger capsules were used in a study involving 120 college students who had primary dysmenorrhea and the results indicated that the use of Ginger significantly reduced the severity and duration of painful symptoms. Widely studied for its possible use in the treatment or prevention of diabetes mellitus and related symptoms, one study found that Ginger could protect against the degeneration of renal cells and reduce the severity of damage caused by certain medications, while another study found that it decreased inflammation in patients with type 2 diabetes. Yet another found that Ginger significantly reduced structural abnormalities in the hearts of diabetic rats. Diabetes patients using Ginger have experienced a significant reduction in blood glucose, triglycerides, total cholesterol, LDL and VLDL cholesterol, while also finding that Ginger helps to protect the liver and kidneys, as well as from other diabetes-related complications. Additionally, Ginger helps people to feel fuller faster, demonstrates antimicrobial and antifungal effects, effectively decreased sperm DNA fragmentation in infertile men, and, in one study, was found to have a potential anti-addictive effect against the chronic use of morphine. It’s also thought to help improve mental function in middle-aged women. Ginger is consistently tested for anti-carcinogenic effects and has been studied for possible use to prevent / treat such cancers as colorectal cancer, prostate cancer, breast cancer, endometrial cancer and cervical cancer. Ginger can be taken as a tea when dealing with menstrual cramps that feel better when you apply a heating pad to your abdomen. Many people like to add Chamomile to the tea to make it even more effective. A warm compress dipped in Ginger tea or a poultice can also be applied to lower abdomen for the same purpose. To make Ginger tea, pour freshly boiled water over a piece of Ginger about the size of the tip of your thumb (you can also mince or slice the piece or use a bit of dried Ginger powder or a prepared tea bag), cover the mug, and let it steep for about 10 minutes. Ginger can be infused into a carrier oil that can be used as a base for warming massage oils (think muscle aches and pains), salves and creams (warming, circulatory applications for cold hands or feet), or even scalp massage oils. I love to add Ginger to hand and foot baths (or even full body baths), especially during the cooler months, to encourage healthy circulation, warm me up, and provide a little immune system boost. A variety of smoothie chains offer juiced Ginger (you can make it at home too), which can be taken plain or used in Ginger lemonades and sodas. Candied Ginger can be stored in an airtight jar and kept in the pantry or your purse. If you deal with carsickness or food-related nausea, it’s a handy remedy to keep on hand. When you make candied Ginger, you also end up with Ginger syrup, which can be added to lemonades, sodas, apple cider and other drinks, or drizzled on pancakes, cornbread or muffins. Include a bit of Ginger in herbal formulas as a catalyst that helps to boost the effectiveness of the other herbs in the formula. It’s wonderful for encouraging a quick-acting herbal synergy. Sprinkle a tiny bit of powdered Ginger in with your dog’s dinner to help encourage healthy digestion. It also works especially well for dogs that are experiencing pain or symptoms of cold in their limbs. I like to use Ginger in my homemade dog food for our German Shepherd – adding it when I’m cooking up proteins, or even adding a piece to the water when I’m making the rice for her food is an easy way to incorporate Ginger into her meals (remove the chunk of Ginger before serving). Ginger-infused carrier oil can make a great base for topical salves and creams that are massaged into the skin when dealing with symptoms of pain that are relieved by heat. Note: If you have a dog that already leans toward a hotter constitution, Ginger may not be the best choice for your pup. Ginger is generally considered a very safe herb, but some herbalists recommend using it only in small doses when pregnant and others recommend avoiding it when experiencing symptoms of heat in the body or when using blood thinning medications. On a scale of 1 to 10, how much do you like Ginger? Let me know in the comments section below. Elderberry syrup is practically a treat in our house. Fresh batches never stick around very long and I find myself making more often. I tested a lot of recipes when I first set out to develop one and finally settled on this one as my absolute favorite. Elder is one of the herbs that is associated with a rich history of folklore in seemingly every culture, perhaps because it is such a noteworthy and powerful herbal ally. The Elderberry used for medicinal purposes comes from the Sambucus nigra tree-like shrub, which produces clusters of dark purple berries in late summer to early autumn. It can grow to be up to 20 feet high and wide, but is often found at heights as low as 3 feet. The plant has a pith-centered stem and compound leaf structure with 5-9 serrated leaves. I have come across a few people groups who still hollow out the branches and use them to make flutes like this one. The branches produce clusters of small, cream-colored, twinkle light-like flowers that are also used medicinally, in food and skin care recipes, and that turn into the well-loved clusters of fruit valued by humans and birds alike. Elder is fairly easy to cultivate and can be propagated by seed or with cuttings. It can thrive in almost any kind of soil, but does like moisture and some good compost. I like to plant Red Clover near its base once the plant has established itself to help nourish the soil. Elderberry seeds seem to have a higher germination rate when stratified (though I know some herbalists who don't think it's necessary) and can be planted in the fall season when they would naturally fall to the earth. Expect fresh little Elderberry seedlings to pop through that soil sometime in early spring. Elderberries are a powerful peoples' medicine but they are usually best used after they have been cooked. The raw fruits can cause nausea and digestive issues when consumed because of the chemical composition of their seeds. Elderberries are most well known for their starring role in Elderberry syrup - a traditional home remedy that is renowned for its ability to help people feel better faster during the cold and flu season. They have been studied a lot in recent years and some of the results of these scientific studies have been impressive, bolstering Elderberry's reputation even in western circles. Elderberry is indicated for a variety of cold and flu symptoms, respiratory infections, sinusitis, fever, coughs, and more. Energetically, it's a cooling and drying herb. Watch the video below to learn how to make it. What do you like to include in your Elderberry syrup recipe? Have you ever made any for your family? Y'all know I love spreading some herbal love and today one of my favorite herbalism teachers is preparing to open up one of her information-packed herbal courses for enrollment. You may know Rosalee as the author of Alchemy of Herbs, a beautiful herbal book that was published earlier this year. Today she is bringing back the Taste of Herbs course through LearningHerbs and...I'm going to be blogging my way through the course with you and hosting a course-a-long in our AromaCulture Facebook group! This particular course is all about learning how to choose the right herb for an individual person based on their particular situation. We all know that choosing the right herb for something can seem like a complicated ordeal at times, but Rosalee, ever the outstanding teacher, makes learning this skill so easy. I think you're going to love this course! Rosalee and John (from LearningHerbs) have made the first part of this online training free so that all of you can participate in it before the actual course opens for enrollment. This online training segment is such a helpful resource and, if you're on the fence about the actual course, will help you to see if the teaching style and course are right for you at this point. The free training segment also gives you access to the Taste of Herbs Flavor Wheel, which is an incredible tool that covers the 5 tastes of herbs that will be covered throughout the course. You can access the online training segment and the Taste of Herbs Flavor Wheel by clicking here. It's completely free - all you have to do is enter your email address to gain access. After we've all gone through the training video together, those of you who decide to enroll in the full course will be able to do so and then the fun part begins. Something I've wanted to start doing here on the AC blog is share more of my thoughts with you as I actually make my way through courses. I'm always working on completing courses from different herbalism and aromatherapy teachers so that I can continue to grow in my own education and I want to start sharing my experience with them with you! I'm going to start doing that through this course by hosting a course-a-long. In addition to blogging periodically about my thoughts about the course here, I'm going to be posting weekly in our AC Facebook group about it. Those of you who are also going through the course will be able to jump into the conversation there in the Facebook group with me. We can encourage each other as we work through our homework assignments, share our "aha!" moments, and support each other as we all make progress through the course material. I'm really looking forward to it - I think it's going to be a lot of fun! =) I'll be posting a video about this particular course-a-long over in the Facebook group sometime today, so be on the lookout for that! I'll be checking in with you with a course update in about a week. Happy learning! Disclaimer: I am an affiliate for Taste of Herbs. All opinions are my own. I had never even heard of chiggers until my husband and I moved to Texas about a year after we were married. (We don’t live there anymore. We decided the West Coast better suited our lifestyle after a tornado hit our street, the whole year’s weather was altogether yuck, and we realized that the farmer’s markets…weren’t. No offense, but Texas just wasn't the favorite.) I was working part-time as a portrait photographer at the time and my work was focused on natural light and dreamy, outdoor settings. I spent one particular session sitting in the grass photographing a client and came home that evening wondering why my legs were so itchy. (I’m not allergic to grass.) I was thus introduced to chiggers. Nasty little things. At that time, the traditional remedy that was presented to me was to paint my skin with clear nail polish (which didn’t work). Fortunately, I don’t live in a place where I have to deal with chiggers any more, but if you do, here are some botanical remedies that may help you get through their assault on your skin and sanity. Plantain (Plantago sp.) – Plantain is a drawing herb with a reputation for quickly soothing insect bites and stings. It helps to draw out the source of irritation and inflammation quickly bringing relief to that itchy, irritated area. The leaf can be applied directly to the skin as a poultice. Either chew up a leaf, then pack it onto the area that’s itching, or crush the leaf in your fingers until it looks thoroughly wet, then rub it into the area. Follow up with another crushed leaf, spread out over the area. It will stick like an herbal bandage. In my experience, it’ll stay there until it’s no longer needed and then naturally fall off once its job is done, but if you’re especially active at the time, you may need to apply several leaves throughout the day. Plantain leaves can also be brewed into a strong tea (try double or triple infusing for added potency) and applied via a compress. In a pinch, the tincture can be applied topically as well. Chickweed (Stellaria media) – Chickweed is a cooling herb that is commonly infused into a carrier oil that is then made into a salve for hot, irritated, inflamed skin ailments. It’s soothing and emollient and can also be used as a poultice applied to the affected area. You can make a double or triple infused tea and apply it topically with a compress as well. 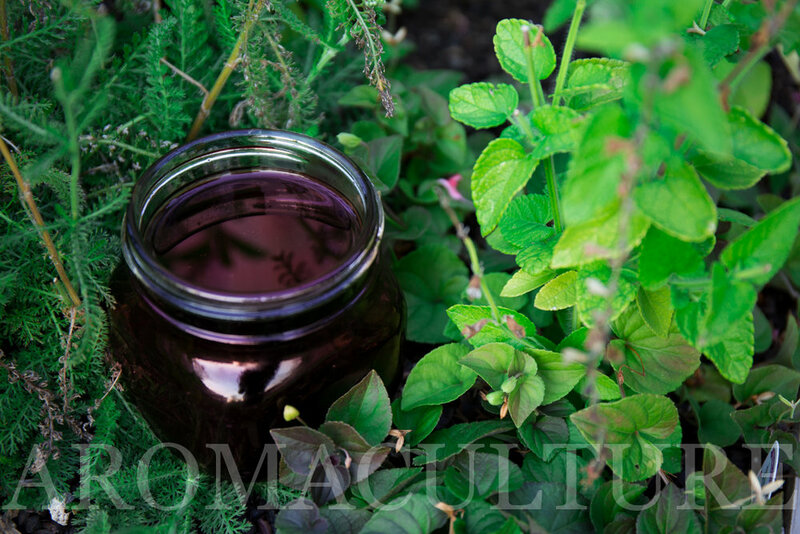 Tincture made from the fresh plant can be used when you don’t have access to the fresh plant. Yarrow (Achillea millefolium) – Yarrow is another cooling herb that acts as a disinfectant and can be helpful for cleansing the area. A liniment can be made by infusing the Yarrow leaf and flower in Witch Hazel and this can be applied topically to the affected area. The hydrosol and essential oil can also be utilized in topical applications for their anti-inflammatory, skin-soothing effects. The hydrosol especially helps to soothe the skin and reduce irritation. Nervine herbs can be taken in teas or tincture form to help your relax through the irritation. Lavender (Lavandula angustifolia) – The first aid kit of essential oils, Lavender is proven to be anti-inflammatory, skin-soothing, and can help to reduce the irritation and redness caused by the chiggers. It can be applied neat, sparingly, for short-term, acute use, or it can be applied diluted in a carrier. Rose (Rosa sp.) – Rose essential oil, though pricey, goes a long way and is wonderfully rejuvenating for the skin. Adding it at a very low dilution to your topical aromatherapy blend can help reduce irritation and may even help the skin to recover more quickly. Helichrysum (Helichrysum italicum) – The essential oil is incredible for helping the skin to recover from a wide variety of ailments and injuries. 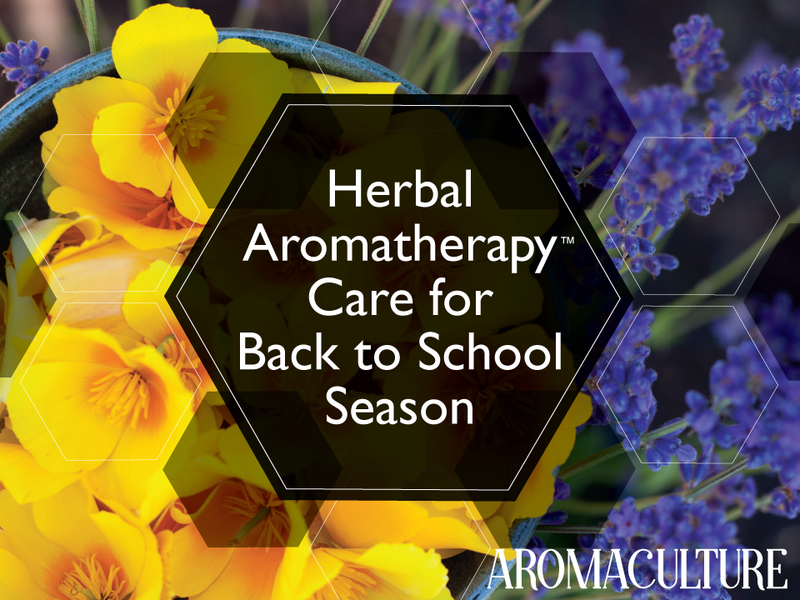 Add it to your topical aromatherapy blend in a low dilution to help soothe and support the skin. Peppermint (Mentha x piperita) – Peppermint essential oil applied at a low dilution can help relieve the incessant itching caused by the chiggers. Valerie Worwood recommends diluting 10 drops of Thyme ct. linalool essential oil in a teaspoon of carrier oil and applying it to the affected area throughout the day, then following up with a few applications of Lavender essential oil over the following days. Adding a bit of raw apple cider vinegar to a full or local bath is one home remedy that many people swear by, while others prefer adding a bit of sea salt to the bath instead. Clay packs – Clay is renowned for its drawing ability. You can hydrate it with a hydrosol or Witch Hazel and apply it to the irritated area the same way you would a clay face mask. Wrap the area with a warm towel to keep the clay moist throughout the application and rinse off when finished. Allowing the clay to dry may increase irritation instead of helping to reduce it, so make sure you keep that towel warm and wet (wring it out so it's not dripping). What do you use to help you deal with the dreaded itch caused by chiggers? Let me know in the comments section below. The Pacific Northwest has been covered in smoke for a few weeks now. In our area, we have reports of over a dozen fires burning nearby and we’re also dealing with smoke from fires in other states as well. There’s a mountain very near our home that we can’t even see this morning [at the time of writing this] because of the thickness of the smoke and our area has repeatedly been placed in the “unhealthy” and “hazardous” air quality categories over the past few weeks. One of the closest fires is currently being sized at over 182,000 acres, has over 1600 personnel working to contain it, and isn’t expected to be contained until mid-October (it’s currently 5% contained). I saw a news article yesterday that said over 320,000 acres of Oregon are currently on fire [at the time of publishing, this number is closer to the 500,000 range]. When faced with circumstances like this, what can we do to support our health while dealing with the smoke (and stress) produced by such conditions? Stay indoors in an air conditioned building as much as possible. Keep your doors and windows shut and reduce your exposure to environmental toxins (cigarette smoke, propane, etc.) as much as you can. Allow yourself to swap vigorous fitness routines for more gentle, relaxing ones on the most smoky days. Limit vigorous outdoor activity or avoid it all together if you are in the sensitive groups category. Listen to your body – if you’re experiencing headaches, fatigue, or respiratory symptoms, take it easy and support your body with home remedies. Seek medical care if you have any cause for concern and, of course, follow your physician’s instructions, especially if you are a heart or lung patient. Allow yourself some extra space for relaxation while you’re dealing with all of the smoke in the air. Run air purifiers throughout your home. We were able to purchase a few HEPA allergen filters (we use this one, this one, and this one in our home) at the beginning of our fire season here and they have made such a noticeable difference. Running them at night has been especially helpful. I was waking up in the middle of the night with lots of congestion and discomfort before we started running them, but ever since we’ve had them going, that has virtually gone away. Himalayan salt lamps can also be helpful, but I would not rely on them solely. Try to limit your exposure to allergens by running the vacuum a little less often (it can stir up dust and allergens), setting aside your smudging ritual for the duration (use Sweetgrass and/or White Sage hydrosols instead), and reducing your exposure to cigarette smoke or the smoke from incense. My main allies throughout this fire season have been Hawthorn and Plantain (Plantago sp.) tincture. A dropperful of Plantain every couple of hours on the worst days has been helping to clear my symptoms quickly and on more mild days, a dropperful in the morning and one in the evening has been sufficient. After we come in from doing our garden chores in the mornings, I take a dropperful in orange juice and it has been tremendously effective for me. You could also consider using Nettle tincture, Mullein, or Marshmallow. The Plantain helps to soothe the mucous membranes and break down the excess mucous that accumulates because of the irritation caused by the smoke and inhaling other particles in the air. There are other herbs that can be used, but I have found that keeping it simple has yielded the best results for me, personally. Daily herbal steams (or baths) can also be helpful. I usually include herbs like Eucalyptus, Rosemary, Thyme, Calendula, and Lavender in mine (one at a time or combined in a blend). Once the water from the steam application has cooled completely, you can use it to water the plants in your garden and add the spent herbs to your compost pile. When you need an extra dose of respiratory support, a homemade herbal chest rub can be of great help. The recipe for my favorite formula was featured in March’s issue of AromaCulture Magazine. You can find that here. Essential oils that help to open up the sinuses will be beneficial in steam applications, smelling salts, or topical applications like chest rubs. Sometimes using an oil that helps you to feel calm and relaxed will be just as helpful for you as any other remedy. 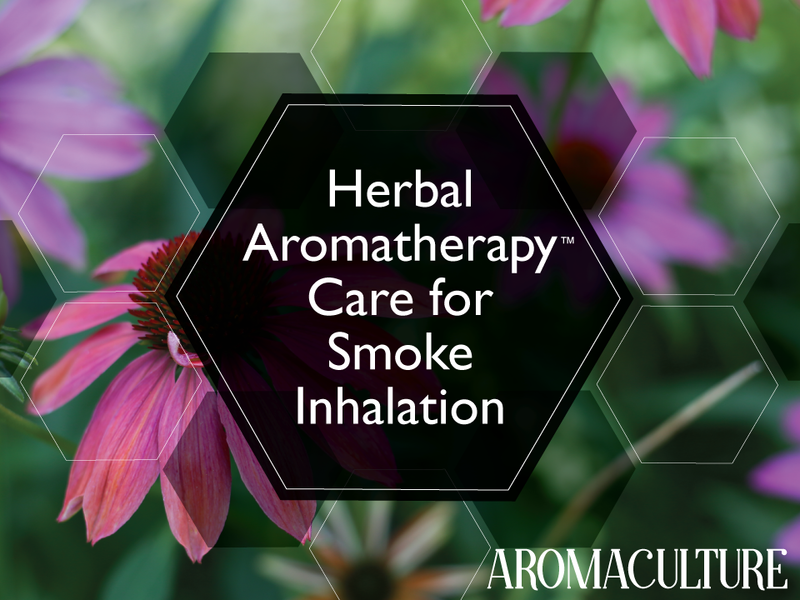 Essential oils for respiratory support throughout fire season can include: Cedarwood, Lemon, Ginger, Eucalyptus globulus or Eucalyptus dives, Siberian Fir, Black Spruce, Norway Pine, Rosemary ct. verbenone, and Peppermint. Use 1 drop in a bowl of freshly boiled water for an aromatherapy steam application, include a blend of your choice in a jar/bottle of smelling salts, or dilute them in a topical application that you can massage into your chest and neck as needed. Pray for our firefighters and for lightning-free rain! I hope you see smoke-free days very soon. What helps you to feel better when you’re dealing with fires in your area? Let me know in the comments section below. I'm a bit of a germ freak. Not in a weird, "Get away from me, I don't want to touch you," way. Just in a, "Okay, please stop coughing in my hair," kind of way. I once spent a few extra minutes in a long line at a local Michaels craft store during the holiday season and the whole time I stood there, a sick woman and her friend stood behind me coughing, sneezing, and sniffling the whole time. They apparently didn't think covering their mouths was necessary because I could literally feel the wind coming out of them blowing through my personal bubble. I caught whatever they had and spent the holidays sounding like a bullfrog and feeling like a bear. Since we're fast approaching the season of increased exposure to vast amounts of [possibly ill] strangers (at school, at the mall, standing in longer-than-usual lines, at the airport, etc. ), I thought this would be a good time to talk about supporting your body's natural defense system with herbs and essential oils. Herbs are full of so many beneficial compounds that help support our well-being and including them in our cooking is one easy way to incorporate them into our everyday routines. Chop fresh herbs from your garden or the farmer’s market and add them to your meals. As the weather cools and your herb garden slows down, try adding dried herbs to your dishes instead. They add complex layers of flavor that brighten up (or warm up) our food while also helping our bodies to be at their best. Drinking nourishing herbal infusions each day can also help build up our body’s ability to stay well even when we’re exposed to people who aren’t. Part of the reason that they’ve become so popular is because they really work! Good herbs to try include: oatstraw, nettles, and red clover. On days when you’re feeling like you need a little something extra, have some Echinacea and Ginger tea or a spoonful of Elderberry syrup. Treat yourself to an herbal foot bath (or full bath) each evening. Adjust the herbs you use based on how your day went and how you’re feeling when you sit down to choose your herbs. Relaxing herbs like Lavender, Chamomile, and Rose almost always make it into my blend. I also like to add flower essences that I choose based on how I’m feeling that evening to my bath blend. For example, if I’ve spent a long day working and can’t get my get-it-all-done brain to shut off and relax, I reach for Oak flower essence and add a dropperful to the bath after I’ve brewed my herbs. Especially during cold and flu season, I like to keep a jar of smelling salts in my bag. The formula I use varies, but it will always include some sort of antibacterial, antimicrobial essential oils. It’s helpful to have it on hand when I’m around a lot of people (i.e. a high risk area) or when I’m noticing that a lot of people around me are sniffling / coughing. It’s also a lifesaver for those moments when you’re standing in line and the person standing behind you is hacking a lung up into your hair. Whip out that jar and breathe in those anti-yuck essential oils to help counteract all of the other who-knows-whats that you’re breathing in at that moment. Using tonifying essential oils throughout the season can also help to strengthen your body’s defense system. Try incorporating regular facial steams into your routine. Put together a massage oil that you can apply to your skin after you step out of the shower. Create a diffuser blend or two that you can use on days when you feel like you need a little extra boost. Make a foot lotion that you can massage into your feet at night to help you relax after a day of work. My approach to essential oils throughout this season is to use them to nourish and tone the body. I don’t use them everyday, but I do use them as needed to help me feel good, strong, and relaxed. Stress adds to the likelihood that you’ll become sick if you’re exposed to something, so keeping your body and mind in a healthy state of relaxation can do wonders for supporting your immunity. Protect your sleep quality as much as possible. Lose the screens and electronics in your bedroom and resist the urge to stay up late finishing that book you just can’t put down. Craft a ritual around your sleep habits that keeps that time of the day protected from distractions so you can do all you can to make sure you get a good night of quality sleep each day. Stay active. A little bit of exercise (even gentle exercise) each day helps to keep your lymphatic system functioning at an optimal level. On days when you can’t work in a full workout or a few laps around the block, set an alarm on your phone to go off every hour on the hour. Whenever the alarm goes off, turn on one of your favorite upbeat songs and take a little break for a dance party and some herb-infused water. I try to take dance breaks every hour throughout the day when I’m working from home. If I don’t, I’ll get lost in my computer screen and forget to get up and move at all except to refill my water bottle and visit the loo. Dancing helps me get moving and releases endorphins that help me to feel happier when I sit back down to keep writing. Win-win. Allow yourself some space to relax each day. It’s okay to say ‘no’ to the things that want to distract you from your purpose. It’s okay to leave something to be done the next day. It’s okay to take care of yourself and the other people who rely on you too. Schedule non-negotiable relaxing time into your day, every day. Trust me – it helps! Take care of yourself, my friend. I want you to be healthy! What keeps you feeling great during the germy seasons? Let me know in the comments section below. While the best option when it comes to dealing with poison oak / poison ivy is obviously to avoid coming into contact with it at all, there are times when we realize we're standing in a patch of it just a few seconds too late. Let's talk about some of the ways we can use herbs and essential oils to aid recovery and ease symptoms. Learn to identify poison oak and poison ivy (or poison sumac, if that's what grows in your area). Practice identifying it and being aware of it when you're outside in an area where it grows. Wear clothing and shoes that cover your skin and bring a pair of gloves along if you think there's a possibility that you'll be touching wild plants. Sometimes people will never develop a rash, but since many do, it's important to watch for developing symptoms over the next few days so you can deal with them as soon as they are noticed. Wash your skin as soon as possible with cool water and soap (one that is not oil based - think lard-based soap or dish soap). It's a good idea to have a soap made specifically for poison oak exposure on hand so that it's there when you need it. Wash clothing as well. Apply Jewelweed to the affected area as soon as possible. The leaves can be juiced, blended, made into a strong tea, or pounded and applied as a poultice. It's a good idea to tincture some when you find it and keep the tincture on hand so you have it when you need it, since the tincture can also be used. Alternatively, you can brew it as a strong, double or triple infused tea and freeze that instead. Store the Jewelweed ice cubes in an airtight container in the freezer until needed. Once you have a rash, your main objective will be to soothe the itching and irritation while you wait for it to run its course. Fresh Plantain leaves (Plantago spp.) that have been crushed between your fingers or whole Burdock leaves that have been boiled and pounded can be applied as a poultice or be juiced / blended and applied as a compress or wash. Fresh chickweed and cleavers are options as well. Alternatively, you can prepare a strong tea with the same herbs, perhaps adding in skin-soothing herbs like Calendula, Lavender, Marshmallow, and Chamomile, and use the tea for a compress. Aloe vera gel may help soothe and cool the area and some folks claim that adding Apple Cider Vinegar (raw) to an herbal wash or even a cool oatmeal / baking soda bath is helpful. When the itching is severe, a clay poultice can be helpful. Support your body internally with alterative herbs like Burdock and Dandelion. They can be taken as teas or in tincture form. Stick to bland foods for meals and snacks, as acidic and spicy foods will make symptoms worse. Keeping yourself distracted as much as possible will help you get through the worst of it without losing your sanity. Try to incorporate herbs that help you relax, like Valerian or Kava, into your day (or night). If you exhibit any symptoms of an allergic reaction, fever, or of the poison entering your bloodstream, seek medical care right away. Do you have any other tips for managing a rash caused by poison oak? Leave them in the comments below. I have a bit of a sunburn at the moment. This past weekend, my husband and I attended an outdoor service and stopped at a local Lavender farm on our way home. We spent some time out in the Lavender fields harvesting delightful purple stems and chatting with the farmers and I came home feeling contentedly sun-soaked and Lavender-calm. It wasn't until I looked in the mirror that evening that I noticed I had turned a bit pink! I had already planned on sharing my go-to remedies for burn recovery with you today, so I had a bit of a chuckle at my ironic timing. If you've ever wondered about the best way to support your skin when you're recovering from a burn or a sunburn, you're in the right place! Note: The salve and spray recipes featured in this article were originally published in June's Skin Healing Edition of AromaCulture Magazine. You can find out more about the issue here. When you're dealing with burns, you have to be able to discern the severity of the burn before you can effectively treat it. If you're looking at second or third degree burns or if the subject is experiencing other symptoms besides mild discomfort, you should consult your medical team. Home remedies are not sufficient in all cases. But when you're dealing with a mild burn or sunburn, there are many things you can do at home to help support the skin as it recovers and to help relieve the discomfort that comes with that dreaded burning sensation. One of the first things I reach for when I'm dealing with a burn is a hydrosol. Lavender and Peppermint tend to be the ones I use most often, but I've also used Calendula, St. John's Wort, and Yarrow hydrosols for the same purpose. Hydrosols help to cool the area where the skin has been damaged (I keep mine in the fridge, which also helps with this) and can also help to soothe inflammation and pain. Each one also contributes its own layer of therapeutic effects. True Aloe vera (not the green junk from the sunscreen section at the store) can be wonderful for burns. It's soothing, cooling, anti-inflammatory, and helps aid the skin as it begins to repair itself. You can either pat a bit of pure Aloe vera gel into the skin where the burn is (don't rub - it will increase the irritation and the heated sensation) or you can pour some Aloe vera juice into a small spray bottle and use it to mist the area as needed. Store the spray bottle in the fridge to keep it cool and extend its shelf life. It's recommended to avoid using Aloe if there is blistering or a raw, open wound, but for minor burns and sunburns, it can be a great ally. I like to take a couple of extra moments to infuse my Aloe with some skin-healing herbs before use. Calendula, Comfrey leaf, and Plantain are all suitable options. The spray in this photo features all three, along with a bit of St. John's Wort. You can also use these same herbs: Calendula, Comfrey leaf, Plantain, and St. John's Wort to make a skin-healing salve that can help reduce the pain and inflammation caused by the burn and support the skin as it goes through the recovery process. I infuse the herbs individually into carrier oil throughout the year and keep a jar of each in my apothecary so I can use them as needed. To make my go-to burn recovery salve, follow the recipe below. It also makes a great all-purpose first aid salve and can even be used as an herbal moisturizing treatment. It's full of skin-loving herbs! Melt the beeswax over low heat in a double boiler, then stir in the carrier oils until everything is well incorporated. Remove the blend from the heat and add your essential oil. To achieve a lighter consistency like that in the photo (instead of the typical, harder salve consistency), let the mixture cool a bit, then blend it with an immersion blender to add a bit of fluffiness to its texture. Pour the finished blend into sterilized tins or jars and keep one, labeled, in your herbal first aid kit. Some folks love to use salve right away on burns and others prefer to wait until the initial burning sensation has eased. You'll be able to discern which option works best for you as you tune into your own remedy and give each method a try. How about you? What do you turn to when you're dealing with a burn? Let me know in the comments below. Walking down the skincare aisle at the drugstore is sort of amusing to me. Shelves and shelves of products with pretty packaging, clinical claims, and long lists of synthetic, chemical-laden ingredients...they don't appeal to me at all anymore, but they do cause me to ponder the reasons our culture tends to so easily buy into their marketing. Before I transitioned to a chemical-free lifestyle, I tried so many different storebought products to try to force my skin into looking vibrant and glowy and clear, but none of them worked long-term and many of them even caused irritation or damage to my sensitive skin. When I started using homemade, botanical products instead of the options offered to me at the local Nordstrom, Target, or CVS, I saw such a drastic improvement in my skin (and my health) that it's hard for me to even fathom picking up a toxin-laden, though prettily packaged, product again. Since June is Skin Healing month here at AromaCulture, I decided to reserve some blog space to talk about my favorite herbs and essential oils for the skin. All of the botanicals in this post are well suited to a wide variety of skincare and first aid applications and can be used for every skin type. They're perfect ingredients to include in your own skincare formulations. Ready to see what made my Top 11 list? So much of the skin's health depends on what is actually happening on the inside of your body. If your liver and kidneys are not functioning well or your digestive system and circulation are a bit stagnant or your gut health is not quite where it should be, you'll start to notice changes in your skin. Acne, blackheads, irritation, inflammation, dull skin...these are all outward manifestations of an inner imbalance that needs to be addressed. Dandelion (Taraxacum officinale) is one of the best herbs for this. It supports the health of the digestive organs, especially the liver (which is directly related to the health of your skin), and helps the body to purify the blood and flush out the yuck that doesn't belong. Any time I start to notice little spots popping up on my face, I know it's time to bring out the Dandelion. My skin thanks me every time. Dandelion can be utilized for the skin via digestive bitters, herbal hand and foot baths, or through the diet. The whole plant is edible. Flowers can be added to salads, roots can be added to soups, and the greens can be cooked down with something sweet and eaten like any other edible green. (The younger leaves are better tasting than older ones.) Generally, the leaves are used as a diuretic (think stagnant issues, like cellulite) and the root is used to stimulate digestion and the production of bile, supporting the liver (and, therefore, the skin). The root can be roasted and brewed as a coffee substitute and is often included in homemade root beer formulas. If you have a latex allergy, you will probably want to avoid Dandelion. That milky white sap that you see when you pick a Dandelion is latex. Burdock (Arctium lappa) is another liver-supportive herb that will indirectly improve and support the health of the skin. It works to correct the internal imbalances that manifest themselves outwardly via issues with the skin (i.e. dandruff, eczema, psoriasis, dry skin, etc.) and is also valuable when used externally for scalp health, wounds, rashes, and inflamed areas. It's great at getting the lymph moving, too, so is again indicated where there is stagnation. My favorite herbal shampoo includes Burdock root as a main ingredient. It can be infused into a carrier oil and included in first aid preparations and skin care formulas or can be decocted and used as a wash. Burdock can also be taken internally as a tincture or as a food. The root is often cooked and eaten as a dish called Gobo and it can also be brewed into a tea and included in homemade root beer soda blends. Burdock is a weedy plant, so it's extremely easy to grow yourself. Start a little patch of it (it'll do well in just about any kind of soil) and harvest the root in early fall. There are no known safety issues for Burdock. Ah, Calendula. Possibly the herb supreme for skincare formulas. This sunny little bloom is chock-full of flavanoids and carotenoids that help to heal the skin. Calendula (Calendula officinalis) is indicated for everything from acne to wounds and helps to reduce inflammation and promote cell repair. It's one of the easiest herbs to grow in the garden and will start blooming in early spring and last until well after the first frost if you keep cutting the stems throughout the growing season. Harvest seeds in the fall or winter to save for the next year's growth. 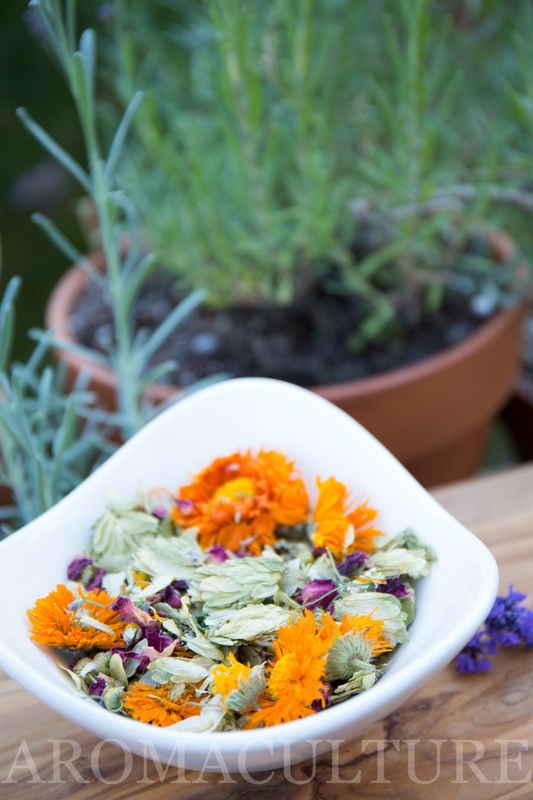 Use Calendula for the skin by infusing the dried blooms into carrier oils for skincare formulations. It can also be brewed as a tea and used as a compress, wash, or poultice (or taken internally). The hydrosol is lovely on its own or included as an ingredient in cream formulas. The tincture can also be used in some cases, though it may be drying when used externally. Calendula also produces a lovely CO2 extract which can be incorporated into topical blends. Comfrey (Symphytum uplandica or Symphytum officinale) seems such a happy plant to me. It contentendly pops its first little leaves out of the soil in early spring and sets right to work filling its plot with cheerful green. It may be one of the fastest growing, most resilient plants in my herb garden. Comfrey is one of those botanicals that herbalists just love. It has an incredible affinity for healing the skin and has such pronounced wound healing properties that it's earned the nickname "knitbone" because it is said to 'knit' wounded tissues back together. Rich in the skin-healing and protective component, allantoin, it's often included in first aid formulas and skin care preparations. Infuse the leaves into carrier oil or Aloe to use in blends or use an infusion / tea as a wash. Comfrey can also be utilized as a compress or poultice. No list of skin-healing herbs would be complete without Lavender. There are many varieties of Lavender products available on the market, but you'll want to look for Lavandula angustifolia for skin-healing purposes. The herb, essential oil, hydrosol, and infused carrier oils are all useful for skin preparations. Most folks who are even the slightest bit interested in herbs and essential oils are familiar with Lavender, so I won't expound too thoroughly on it here, but do know that it can be included in just about every herbal / aromatherapeutic product you ever make for the skin without seeming out of place. Aside from its own contribution to the therapeutic effects of the blend, it seems to marry together all of the other ingredients you choose to include to create a more potent synergy. Lavender is another easy-to-grow herb that will do fine in well drained soils to a zone 5. In cooler areas, it can be grown in a pot and brought in during the colder months. We're growing about a dozen varieties this year and it hasn't taken me long to decide that it's my favorite herb to grow. There's nothing quite so lovely and delightful as this sweet plant! Infuse Lavender buds into carrier oils, Aloes, and honeys. Use the tea as a wash. The herb can be used as a compress or poultice. The hydrosol is lovely on its own as a facial toner or body spray or as an ingredient in creams. The essential oil can be added to most any skin care or first aid formula. Who doesn't love this sunny little plant? The St. John's Wort used for skincare is Hypericum perforatum, which can be easily identified by the little "holes" in its leaves. When you hold a leaf up to the sunlight, you'll see little dark specks (or perforations) on it. The top 4-6" of the blooming plant is used. The plant is ready to harvest when the buds produce a reddish-purple stain on your fingers when you press them. If you don't see this stain, you're either too early or too late. Watch your patch closely when the weather starts to turn toward summery temperatures near the end of June - the perfect harvesting window is short! Some will be ready and some won't. If you're unable to gather enough in one harvesting session, check back every day or two for the next week to see if more flowers are ready to be collected. St. John's Wort can be infused into carrier oil (it will turn a bright, deep red color as the flowers release their medicinal properties into the oil) that can be used in both first aid and skin care blends. It's useful for external wounds, burns, cuts, bruises, areas of trauma, and inflammatory complaints and helps to speed recovery. Some folks include it in preparations for shingles or herpes. It's excellent for helping to relieve pain as well, so it's often used in massage oils for sore muscles or injuries. Some people experience photosensitivity when using St. John's Wort, so be aware of any areas of your skin that will be exposed to direct sunlight after applying. If you experience any sort of rash or discomfort, stop using it. Helichrysum (Helichrysum italicum) is probably most known for its lovely, skin-healing, anti-aging essential oil. It's pricey, but oh so lovely and effective. It helps to speed recovery of wounds and is often used in first aid applications. It's also excellent in anti-aging skincare products and posh facial creams. One well-known brand uses it in their fancy hand creams and another in their makeup products. The hydrosol is wonderful for use as a facial toner or body spray and can also be used in herbal creams. A teaspoon of it can be added to a luxurious bath (or hand or foot bath). The herb itself can be infused into carrier oils or brewed as a tea for use as a wash. It's beneficial for a wide variety of skin ailments, including acne and eczema. Plantain (Plantago spp.) is another weed-like plant that grows along the trodden path; it likes to follow human footsteps and spring up right where it is most likely to be needed. It's a skin-soothing herb that's especially great for skin irritations like bug bites and stings. Just the other day, I was planting out some new herb transplants into my garden and something decided to bite me. The swelling, itching, and burning reaction didn't seem too bad at first so I carried on with what I was doing, but within a few minutes, the bite had turned into quite a painful welt. I walked over to my bed of Plantain, picked one of the leaves, crushed it with my fingers and rubbed it over the area. I then used a fresh leaf, also crushed, to lay over the area as an herbal bandaid (it will stick on its own if you've crushed it). Within a few minutes, the itching and burning had stopped and when the leaf naturally fell off 15 or 20 minutes later, the Plantain had completed its job. I couldn't even tell where the bite had been. Plantain can be used in a carrier oil or Aloe for first aid and skin care preparations to soothe and reduce inflammation and irritation and can also be taken internally as a tea (or used externally as a wash) for other issues. Rose petals, Rose hydrosol, Rosehip seed oil, Rose flower essence, and precious Rose essential oil are all derived from this one generous plant. I like to incorporate her into every step of my own skincare routine. Rose essential oil is also beneficial for wounds when there has been trauma. It will not only help with speeding the recovery of the skin, but will also comfort the heart and mind and work to bring stability back to the person affected. Carrot Seed (Daucus carota) is available both as an essential oil and as a CO2 and an infused carrier oil. All are beneficial for the skin. It's one of those plants that's also beneficial for the liver and is helpful for releasing blocked energy, so we know it's going to be amazing for our skin! Include it in topical blends for a variety of skin ailments, including eczema, psoriasis, acne, and other inflammatory, irritated conditions. It's also useful for anti-aging skincare products and can be used in carrier oils, creams, and facial steams. Marshmallow (Althaea officinalis) leaf and root are both used for skin and hair formulas (root is more commonly used, but the leaf can also be used). It's rich in flavanoids, polysaccharides, and beta-carotene and is mucilaginous, making it skin-soothing and anti-inflammatory. You can infuse the root into a carrier oil or Aloe to use in a blend or you can prepare a decoction and use it as a poultice or wash. It blends well with Chamomile tea for this purpose as well. It's effective for a variety of ailments, including eczema, burns, and wounds, and will help to moisten dry skin. Powdered root can be included in homemade baby powder blends. I couldn't choose just 11 after all! Yarrow (Achillea millefolium) is so useful in the herbal first aid kit that I felt it had to be included in this list. The leaves are styptic and antiseptic and can be powdered and used in styptic powder recipes or used fresh when needed. All of the aerial parts of the plant can be used to help speed healing of wounds, burns, and other skin ailments. The foliage is light and feathery and the flowers are lovely; it's easy to grow from seed (perennial) and the pollinators love it. Look for the white or pink flowering varieties if you want to use the herb medicinally. The yellow flowering varieties are ornamental. Use the herb in hand and foot baths, washes, and compresses to help reduce inflammation and speed healing. I've used Yarrow hydrosol as a styptic in a pinch and it seems to be just as effective as the herb itself, at least for minor cases. It can also be used as a facial toner or as an ingredient in creams. The essential oil is antispasmodic, anti-inflammatory, and analgesic. Include it in blends for your first aid kit to help with the pain and swelling associated with injury. For skin-care, it can be a useful ingredient for irritated, inflamed skin complaints. WHICH HERBS AND/OR ESSENTIAL OILS WOULD YOU ADD TO THIS LIST?